It was early in the year 2000 that my co-worker at the time, Paul Tisl (@PaulTisl), introduced me to VMware Workstation 2.x where we both worked for a large bank. I remember being paranoid at first that installing a Windows VM was going to hose the boot record of my physical workstation. Sometime around 2008 I first started hearing rumours about an advanced VMware certification with a design focus. By this point I already had a few VCPs under my belt. Collectively I had built a handful of virtualized environments and I was spending a lot of time on the VMware forums covering as much as I could including expert level topics with knowledge I had picked up from others in the community including some key ones such as (in no particular order) Scott Herold, Mike Laverick, Ron Oglesby, Ken Cline, Steve Beaver, Thomas Bryant, Jason Mills, Joel Lockbaum, and Brian Gallob. 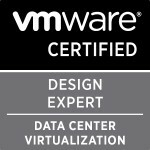 I was already a proponent of technical certifications so combined with my VMware focus and enthusiasm, it seemed pretty clear that VCDX should be next on the list of goals. Admittedly, at the time with no program details, I didn’t realize how difficult it would actually be. I assumed it would just be a few more advanced exams at the local testing center. I was partially right. That’s an interesting question and the answer really depends on what a person considers the starting point of the journey. If I focus only on the program questionnaire, the 3 written exams, the design submission, and the defense, then I’ll tell you it took a little less than a year. I went through the process fairly early so you have to factor in at the time the program moved somewhat slowly from step to step where candidates were invited to the next phase at some point after completing the previous phase and there were significant gaps of time between each phase before the next invitation would come from VMware. I began the written exams in July of 2009, submitted my design and defense application in December, and passed the defense in February 2010 at Partner Exchange in Las Vegas. However, I would argue “the journey” doesn’t start with written exams. Much of what’s tested on comes from experience in the datacenter and that doesn’t solely equate to VMware experience. The required skillset extends well beyond the boundaries of a hypervisor. Storage, networking, security, operations, documentation, presentation, design, troubleshooting, all of these skills are required at one point or another during the written exams and then finally are all tied together for the design submission and defense. To summarize, my certification track took roughly 9 months but the journey is measured in years. Understand that it takes commitment in terms of family/work/life balance so make sure the time is right for you and your family. The process takes time. There are no shortcuts. Take it slow and absorb what you pick up along the way because you’ll need to summon everything you’ve learned at the very end. Should the hard work pay off with a passing result, you’ll want to retain these skills anyway as you move forward with your career and give your best to each of your valued clients. Also understand that VCDX certification is not meant for any stage of every person’s career path. There are many VCDX resources and accounts available for reading on blogs. Read through several of them to get a clear understanding of what’s required and then perform an honest assessment of yourself. Ask for an honest assessment from credible peers. Make sure you’re ready and you’re cut out for it. Merely having the financial backing to get through the process is not a substitute for the skillset required to achieve success and there is absolutely no shame in waiting. Rushing prematurely will more than likely yield frustration in the process. Considering I was lucky enough to achieve a successful result on my first attempt, I’d be a fool to change anything. Ok, I would change one thing: I would have submitted a complete set of design documentation the first time around instead of forgetting one key document. Fortunately VMware allowed me a few extra days to come up with the missing document while still securing my defense slot. When I went through the VCDX process, I was in a VMware customer role and had worked in a customer/end user roles in large enterprise environments for 13 years. I was not working as a consultant or architect for a partner or a vendor. Upon passing, I received a few personal congratulations but the VCDX goal was my own personal goal and not a goal established or valued greatly by my employer. I am grateful that my employer funded my expenses but if required I would have paid for them myself since I had the momentum and the desire. A year later, in order to put my skills to better use, I moved to a VMware partner. Was it worth it? Absolutely. No question about it. Categories: Certifications, VCAP, VCDX, Virtualisation | Tags: VCAP, VCDX, VMware, VMware Design | Permalink.